Animal trainer Dawn Brancheau was killed Wednesday at SeaWorld Orlando. (CNN) -- A killer whale killed a trainer Wednesday afternoon at SeaWorld's Shamu Stadium in Orlando, Florida, a public information officer for the Orange County Sheriff's Office said. The 40-year-old woman, identified by sheriff's spokesman Jim Solomons as Dawn Brancheau, was in the whale holding area about 2 p.m. when "she apparently slipped or fell into the tank and was fatally injured by one of the whales," he said. But a witness told CNN affiliate WKMG-TV that the whale approached the glass side of the 35-foot-deep tank at Shamu Stadium, jumped up and grabbed the trainer by the waist, shaking her so violently that her shoe came off. A SeaWorld employee who asked not to be identified confirmed the description of the attack and added that the whale involved is named Tillikum. SeaWorld uses "Shamu" as a stage name for any of the male or female orcas in its shows. Video: Was killer whale just playing? The incident occurred after a show called "Dine with Shamu," said Paula Gillespie, who attended with her daughter. "During the show everything was perfectly fine," she said. Afterward, "we went down to look at his full body underneath the isolation tank," she said. "Everything seemed calm and OK. The trainer was laying down on him and kissing his nose and rubbing him." But the scene changed quickly, she said. "Within five minutes, she was down in the tank and we saw all the thrashing and the bubbles and him pushing her with his nose," she said. "It was just so, so traumatic." Within moments, sirens went off and SeaWorld employees asked her to leave the building, she said. A woman who had watched the whales perform before the incident said the trainers were having difficulties getting the whales to perform. "They weren't following the instructions," Lori Miller said on "Larry King Live." "And the senior trainer actually came out onto the stage to let the crowd know ... that the whales decided they were having more fun splashing each than splashing the crowd." Guest David Dalton told CNN affiliate WFTV, "All of a sudden, out of nowhere, two of the bigger whales just kind of flipped out, going as fast as they could in the water." 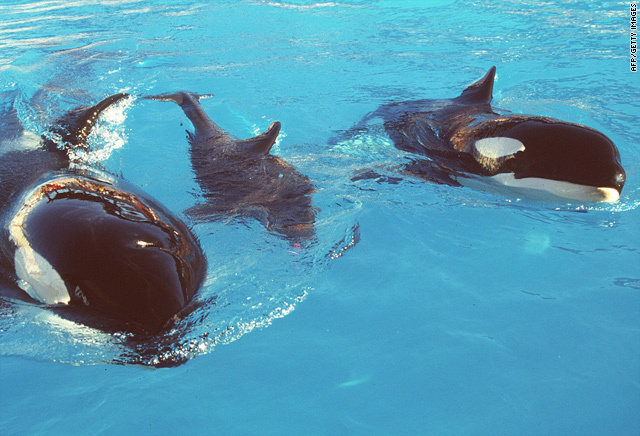 Jeffrey Ventre, a former SeaWorld trainer, described Brancheau as "a great trainer" and Tillikum as "a great animal" who has sired 13 offspring. "He's huge, he's impressive; people just see him and they go 'Wow!' He's a money stream as well." Fred Felleman, a marine consultant in Seattle, Washington, said keeping the social animals in what amounts to isolation is bound to cause problems. "The fact is we don't have the facilities to adequately accommodate not only the physical needs, the psychological and social needs of these animals," he told CNN affiliate KIRO-TV. "We respect lions and wolves and wild dogs as fantastic things, but we don't go run into the Serengeti and try to jump on their back." Jack Hanna, director emeritus of the Columbus Zoo and Aquarium in Ohio, said he knew Brancheau and that she would want her work to continue. "What happened is something that happens; it happens in our line of work," he said. "They are dangerous animals; they're wild animals." He added that he hopes SeaWorld continues with the work it does with killer whales. The Orange County Sheriff's Office said the man apparently hid in the park until after it closed and then climbed into the tank. The 11,000-pound, 22-foot-long whale was "not accustomed to people being in his tank" and "wouldn't have realized he was dealing with a very fragile human being," Solomons said at the time. "He may have been a victim of what a whale would call horseplay, just playing around," Solomons said. CNN's John Couwels and Brian Todd contributed to this story.